Picked up Brian early and took him uplake to catch bait, John and his Dad would be a little late today. Caught bait easily and ran boards on a 15' flat with no success. 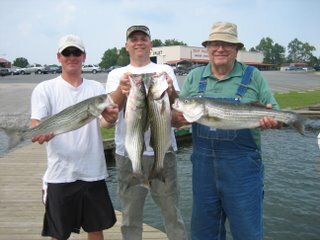 Picked up other two clients and set up on a flat that I fished yesterday morning where we caught 5 Stripers and ran it with no luck. Was a bright and full moon last night and I thought it would make things tough today but no hits? Pulled up and hit a deeper flat nearby and poped 1 Striper in 16' on a board so I held that depth and ran the contour , hooking up with a couple other nice Stripers. The fish seemed to want the larger Gizzard but I only had a few. Fished 4 other flats with no luck and ended up with 4 Stripers and a couple of Cats.